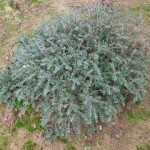 A dense, mounding, low shrub with very small, shiny dark green leaves. Fall color is deep red. Tiny pink flowers occasionally appear in summer. It can be semi-deciduous in some years. It prefers well-drained soils and full sun. 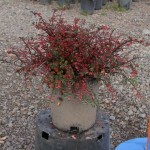 Useful for erosion control, as a ground cover, or for mass planting. The scale of the tiny foliage makes it ideal for many applications where a miniature look is desired.